ePosters - She Pregnant - but Don't Panic! 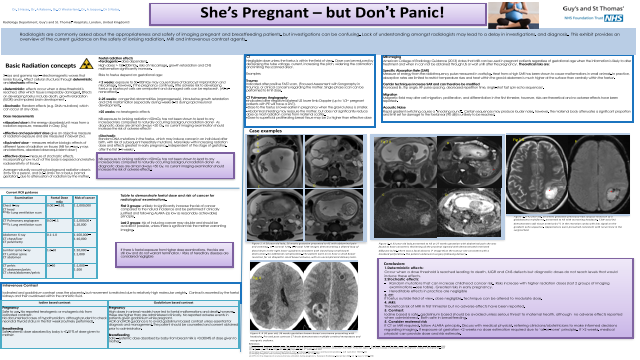 Poster Title: She Pregnant - but Don't Panic! Abstract: Radiologists are commonly asked about the appropriateness and safety of imaging pregnant and breastfeeding patients, however, investigations can be confusing. Lack of understanding may lead to delays in diagnosis and treatment. This exhibit will aim to provide an overview of the current guidance regarding indications and safety of X-ray, CT and MRI in pregnant and lactating patients. Guidance on intravenous contrast will also be provided. Examples are provided of cross sectional imaging in pregnant patients.